The only true city in the Highlands, Inverness offers a wide variety of sights and charming atmosphere, enhanced by the city’s scenic location on the River Ness. It is an ideal start for the discovery of Scottish mountains and islands in the northern part of the country. The bustling city centre is a treasure trove of attractions as well. 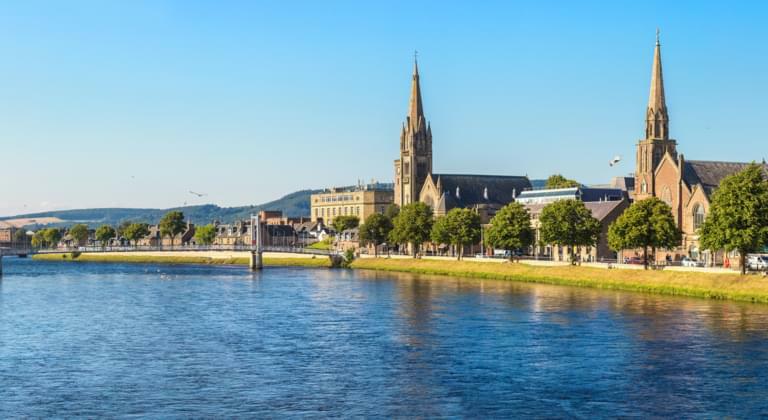 Travellers visiting Inverness will be pleasantly surprised by the abundance of restaurants and entertainment venues located on both banks of the river. The magnificent surroundings of Inverness are characterised by sundry sea cliffs, promontories, towering mountains, and glens. This diversity of natural gems makes up two-thirds of the whole country. The weather in Scotland is extremely unpredictable. However, temperatures in summer reach the average of 18°C so the most convenient time to travel to Inverness is from spring to summer. Most attractions in and around Inverness can be conveniently discovered with a rental car. With DriveBoo, you can compare different car rental offers and book your rental car directly online. What is the best place to rent a car in Inverness? There is a plethora of car hire opportunities both inside and outside of the city limits of Inverness. However, the most convenient and recommended way to hire a car is at the airport. If you arrive at Inverness Airport (INV), you can enjoy the start of your vacation right after touchdown. A rental car will offer you full freedom to move between the tourist attractions. Get a detailed overview of all the top offers and vehicles! What about the insurance of my rental car in Inverness? It is worth remembering that each rental car in the European Union must be covered by civil liability insurance that is valid throughout the Member States. The rental price should include civil liability insurance. You can additionally buy a non-compulsory insurance covering, for example, legal aid, accidents, or car damage. Most importantly, you need to read the terms and conditions of the rental agreement carefully in order to make an informed decision about whether or not you want any additional insurance. In Scotland, left-hand traffic applies. If you are an inexperienced driver, you should practice your skills on less frequented roads. You must be at least 18 years old to hire a car. You should have a valid driving licence. A European driver's licence is sufficient. Each vehicle should be equipped with a warning triangle. Extinguisher, spare bulbs, and first aid kit are also advisable to have them in the boot. You and your passengers are required to wear seatbelts. What are the speed limits for cars in Scotland? Are there any toll roads in Scotland? What is the legal alcohol limit while driving in Scotland? The permissible level of alcohol content in the driver's body is 50 mg.
How much do I have to pay for speeding fines in Scotland? The easy way to begin a trip around Inverness is to start from Gothic Town House which dates back to the 19th century. It can be found on the High Street, which is additionally characterised by interesting architecture and old buildings. Looming above the highest buildings in Inverness is the famous Inverness Castle. Erected in the 19th century, it offers a stunning view of the city’s most prominent monuments and sights. Inside, travellers will be able to see the Sheriff Court and experience the Castle Garrison Encounter, which is an intriguing interactive exhibition. Not far from the fortress, holidaymakers can visit the Inverness Museum and Art Galleries. This tourist attraction will bring you closer to the topic of geography, history, and geology of the Highlands. The building holds an extensive collection of silverware, weapons, bagpipes, and taxidermy. At Kiltmaker Centre, you will learn more about tartan and its production process. The finished products are available at the local shop. The surroundings of Inverness offer a great variety of tourist attractions ranging from a day on a golf course, to long strolls around mysterious lochs, to exploration of medieval fortifications. All this will be possible with a rental car at your disposal. Urquhart Castle is another wonderful historical fortress. It was constructed in the 14th century. Unfortunately, as it was blown up at the end of the 17th century, visitors are only able to admire the remains of the fortress perched on a hill. It can be found around 17 miles from Inverness. The castle was built in the second half of the 14th century. At the beginning, it was used as a private fortress belonging to the Thanes of Cawdon. Even though it is still owner by the family, the castle is open as a tourist attraction. Cawdon Castle is located approximately 15 miles from Inverness. Loch Ness can be found about 14 miles from the city centre. It is one of the most popular tourist attractions in the UK. According to the legend, the lake is home to a mythical monster known as Nessie. The legend is still alive thanks to the Loch Ness Exhibition located at Drumnadrochit Hotel where you will learn more about the lake’s past and Nessie’s story.